Papa Ratzinger tried to establish a correct translation of the word pollon [many] in the Eucharistic Prayer. He was unable to secure compliance from some Episcopal Conferences. In this reversed-mirror-image pontificate, PF desires a correct translation of me eisenengkes hemas eis peirasmon [lead us not into temptation] to be replaced by a false one. And the Italian Episcopal Conference was not allowed even to have an opinion about whether the old, accurate, translation could be one of the options upon which they voted. They were instructed, from above, as it were, that the only liberty to be allowed to them was between new and erroneous translations. One crack of an Argentine whip and people, it appears, hardly dare breathe. So much for the proud notion of the 1960s that Bishops are successors of the Apostles rather than mere Vicars of the Roman Pontiff. What price now, Vatican II and all those brave words! And whatever did happen to the policy of leaving matters to local decision? Only weeks ago, the American bishops were forbidden to discuss the Abuse Crisis ... because the February meeting in the Vatican (with PF sitting there to hear every word that is said and to mark every speaker) will be primed and programmed to decide that "Clericalism" is the real problem. It would have been so dangerous to risk any alternative analysis acquiring traction among those several hundred American bishops. Papa knows the answer already, because Papa knows everything. Our Protestant brethren sometimes forsaw more clearly than Catholics did, where the dangerous papal personality cult could lead us if it ever got into the wrong hands. Fifty years ago, non-Catholics might say things like "Even if the pope were to change the Ten Commandments or the Lord's Prayer, you'd just do as you were told. When he says jump, the only question you people ask is 'Please Sir, how high do we have to jump?'". "Dearie me No", we would confidently reply in honest innocence. "No pope could possibly dare to go as far as that!!". No previous pope would have dared to "go as far as that". But, as one of PF's own circle has claimed, PF is free from the constraints of Scripture and Tradition. And it became clear in the debate about 'remarried' divorcees that we now have a Roman Bishop who has no problem whatsoever about setting aside the most explicit recorded words of the Incarnate Second Person of the Blessed and Undivided Trinity. Words sustained by two millennia of Holy Tradition. Truths still authoritatively taught by his immediate predecessor only a decade previously. The problems of this pontificate have nothing whatsoever to do with Primacy or Infallibility, so wisely defined and so moderately taught by Vatican I. Bergoglianism, as promoted by PF's elite circle, is nothing less than a vulgar and preposterous claim to Divine Omniscience and Divine Omnipotence and Personal Inerrancy. No wonder PF describes critics and whistle-blowers ... amid much other abuse ... as Judas Iscariot. I understand that pollon means many, but I also note that in the barbarous English usage Hoi Polloi is used to refer to the rabble. Can I ask whether it would be possible to imagine that the Gospel author is using it to mean 'the multitude', and this is an accurate reflection of Jesus's words. This 'Lead me/us not' formula and then its obverse reinforcement 'but deliver me/us' is a typical Hebrew/Aramaic antithetical emphasis found in the OT passim, e.g. throughout the Psalms. Naturally, Our Lord (who was a Jew in a Jewish society, formulating a Jewish prayer) could not possibly anticipate the straitlaced literal-mindedness of modernistic western virtue-signalling inhabiting his Apostles' successors. But then, neither, until 2013, did I.
I have to say that it's sad. But it's also rather unimaginative. I mean, why wouldn't the Italian bishops all abstain, or all refuse to show up, or cancel their meeting on account of bad health/weather/airline prices? I mean, if we're going to have a lot of aggressive aggressive, why not (at least) do some passive aggressive or peaceful non-cooperation? Why not drag the feet a little? It's not as if the US bishops get funding from the Vatican. Heavens, no. Totally the opposite. So why are our US bishops being obedient, in matters that aren't really Rome's business, and in which Rome never does anything to help? I was made aware in France last year of a change in the French translation of the Lord's Prayer, which I can remember thinking rather odd and unnecessary. Can I ask you to explain further what changes to the meaning of the Greek and Latin texts the new translations accommodate? E sapelion: 'For many' follows the Words of Institution according to Matthew ('peri pollon') and Mark - ('iper pollon'). Those phrases both mean the same thing: 'for many'. Those words do not include the definite article, so here 'pollon' cannot mean anything other than 'many'. “With PF sitting there to hear every word that is said and to mark every speaker”. I suppose PF is indeed (so to speak) fit to be a participant in a "publici consili". Does he "notat et designat oculis unum quemque"? If so I am sure not "ad caedem". There is something nasty in human nature that actually likes kowtowing and cringing before a capricious and vindictive potentate, while also enjoying mocking and hating those who are kindly and erudite - nothing worse than someone brighter and nicer, nothing more secretly desired than one abjectly to crawl before. Pope Francis/Jorge Bergoglio sounds like a Peronist-style bully-boy godfather running a gang; for public consumption when speaking to the media, gentle words full of personal humility, whilst behind the public's backs ordering hits! (Remember: the Franciscans of the Immaculate, the Knights of Malta, those Cardinals, bishops and others removed or restricted whilst others are promoted -- and despite their known perversions and illegalities!). Seems to me that although he was elected pope, (admittedly, it has been suggested, by chicanery,) he's clearly an apostate Modernist politician, rather than a supreme shepherd. Although it is true that recently he has been stating true Catholic doctrine more correctly, normally he either teaches fluffy, serpentine theology open to various interpretations or utter heresy in direct contradiction to established Catholic dogma -- AND certainly he misrepresents the meanings of Our Lord's clear statements within sacred scripture. The Bishop of Rome desires to change the Our Father to reflect the desire for how it ought be prayed as expressed by Mons Lefebvre - is one possible way to look at it. Any Christian who has an instinct for God, a respect for Him, must be shocked by the manner in which prayers are said now. Learning prayers by heart, as we did, is now denigrated as “parrot-fashion.” Children are no longer taught the words nor do they appear now in the catechisms, except for the Our Father. And even that is in a new version, of Protestant inspiration, which makes the child address God as “tu”.2 To do this systematically is not a sign of great reverence, and is foreign to the spirit of our language, which offers us a choice of styles according to whether we are addressing a superior or a parent or a friend. And in the same post-conciliar Our Father, one asks God not to “lead us into temptation,”3 an expression that is equivocal, at least; while our traditional French version is an improvement upon the Latin, which is rather clumsily based on the Hebrew. What progress is there in this? 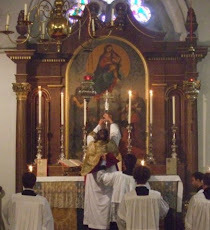 The familiar style of speech has also invaded the whole body of vernacular liturgy: the new Sunday Missal makes it exclusive and obligatory, though one can see no reason for a change so contrary to French style and custom. Trads who criticise Francis when he is wrong must congratulate him when he is right, right? Even with the limitation of the Pope's authority to change the faith, there is still a potential challenge between bishops and Pope over whether the faith is really changed by Proposition X or Y. Thus, even if we take the strong conditions of Papal infallibility in Pastor Aeternus (can't change the faith, ex-cathedra, etc,etc), there is still no available organ in the Church through which to challenge a Pope on a doctrine since his authority cannot be hindered. One may challenge such a Pope, but to what end? We've closed the door on Conciliarist ideas. Moreover, what penal action can be taken against a heretical Pope who has the support of the majority of the Episcopate under him? I think Catholic scholars need to turn their attention to this point. The irony is that when (in that December 2017 interview in ABS's America magazine link) the Pope says, 'the phrase “do not let us fall into temptation,” which is currently used by the French church'. But it isn't. It never was. Pope Francis was instead quoting the Spanish version, which uses the verb 'fall [into]' ('caer'). It is of course the version he grew up with, so naturally he approves it! The French version closest to that Spanish phrase is the traditional, pre-Vat2 version that Mgr. Lefebvre was citing: "Et ne nous laissez pas succomber à la tentation." In the later Post-Vat 2 version (using the controversial 'tu' form), the line in question was translated: "Et ne nous soumets pas à la tentation". Which is closer to the Greek and Aramiaic, but not as close as are and were the Latin and English translations of the Greek. Besides his confusion of the French with the Spanish, Pope Francis appears not to have realised in December 2017 that an even newer version had been introduced throughout all French dioceses only a few weeks before (in Advent 2017) in which the line finally follows the Greek and Latin : "Et ne nous laisse pas entrer en tentation." Mgr. Lefebvre would probably have found this version even more alien to Gallic tradition, but it is, for once, an accurate French translation. Clearly, Pope Francis would prefer Our Lord to alter his Aramaic prayer to accord with the Spanish version PF is more used to. Amateur Brain Surgeon, I think you are trying to translate a Latin to French to English phrase and making a bit of a mess of it. If the words used in French for many years are well-established, and alongside the Latin in the missals, there is no need to make an argument where there is none. In English, we, too, have our own longstanding translation.